A band is called a bandage when it is placed on the patient’s leg and, therefore, its properties are different. A band may be more or less elastic, while a bandage may have more or less rigidity. Bearing in mind that we have just celebrated the II European Conference on Venous Ulcer and Compression, in which it has become clear that WITHOUT TRAINING THERE IS NO OPTION! 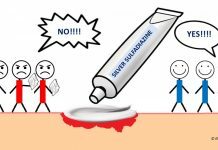 we are going to remember basic concepts to understand compressive therapy. Before continuing, I invite you to visit the Educational tools section of the website of the International Compression Club, where you will find more details of the concepts that we are going to discuss. Let’s start the training! These are two in vitro properties of a band. Extensibility is the ability of a band to stretch in response to an applied tension. Elasticity is the ability to return to its original length when that tension is reduced. Simply put, a band with great extensibility will also have great elasticity and vice versa. To classify bands according to these properties, the terminology short-stretch and long-stretch is used in Europe. In Spain, professionals usually talk about low and high elasticity bands (also called inelastic and elastic). 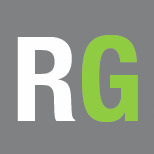 In a reductionist way, we commonly speak of elastic bandages to refer to those that make pressure during both rest and exercise, adapting to the changing diameter of the calf, while we consider inelastic bandages when their pressure at rest is low and increases in peaks with muscle contraction. If we place a single band, elastic or inelastic, its in vitro properties may approach those in vivo. However, as we will see below, a bandage is more complex than a band. The first term is an inherent feature of any bandage. Any bandage placed on one leg will be a multi-layer bandage, even if only one bandage is applied, as there will always be some overlap between layers. If one or several single-type bands are applied, the bandage will be single-component. If we overlap bands with different physical properties, the bandage will be called multicomponent. The pressure under the bandage at a given point is higher the greater the tension (force applied to the bandage during placement), the greater the number of layers, the smaller the radius of circumference at that point of the limb (greater prominence, e.g. pretibial region) and the narrower the width of the bandage. The ability to maintain over time, and during movement, that degree of pressure depends on the properties of the bandage components. Padding to homogenize the perimeters of the leg in patients with alterations in the morphology of the limb. The objective is to obtain an adequate pressure gradient, as in legs with physiological proportions. The bandage will exert a decreasing pressure from the ankle to the calf, as the diameter of the limb increases and therefore exerts less pressure in the proximal area. Padding to protect bony prominences and other sensitive areas from hyper pressure. The pretibial region or the Achilles tendon area are two locations that require special protection to avoid damage from local excessive pressure. 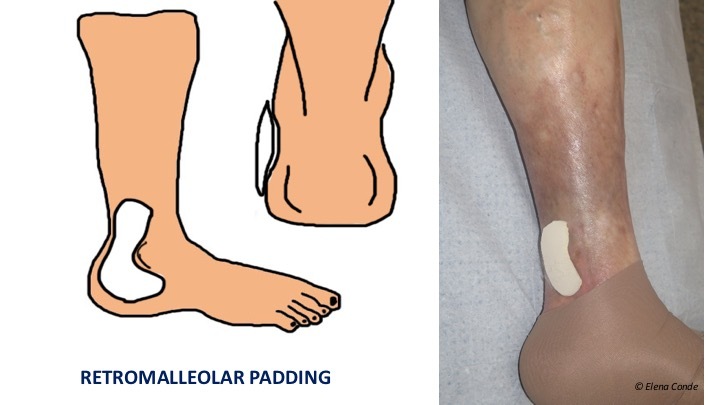 Padding to increase retromaleolar pressure. Compression therapy to promote healing or prevent the recurrence of wounds located behind the malleolus must overcome the “tent” effect that usually occurs in that concave area after placement of the bandage or compression stocking. The use of padded devices to fill this gap (always with bevelled edges and placed with the smaller surface side on the skin) helps to increase local pressure and therefore the effectiveness of compression therapy. It is a property of the bandage, that is to say, an in vivo property. It is defined as the resistance of the bandage to changes in calf muscle volume during movement. The greater the stiffness, the greater the effectiveness in reducing venous hypertension while walking (ambulatory venous hypertension). By presenting resistance to muscular contraction, high pressure peaks are achieved and, consequently, brief and intermittent venous occlusions, similar to physiological valvular function, occur. At rest, these peaks do not occur and the pressure is lower. 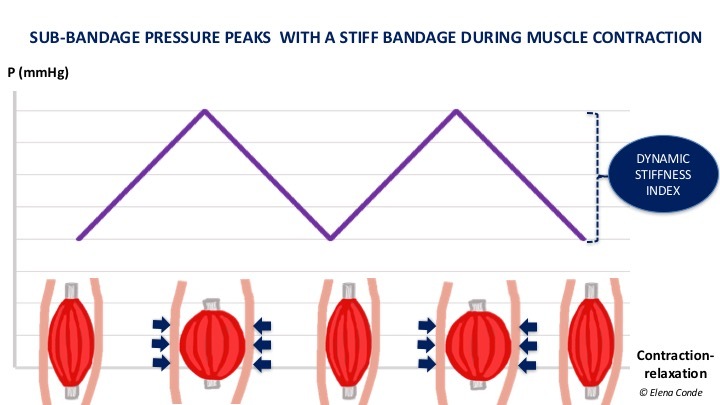 This difference in pressure is called the Dynamic Stiffness Index, which is greater the more resistance the bandage presents to muscular contraction (to put it another way, “greater impact of the muscle against the bandage”). If the bandage is not very rigid, there are no pressure peaks during activity, as it adapts to changes in calf shape, with little resistance to increased muscle volume. 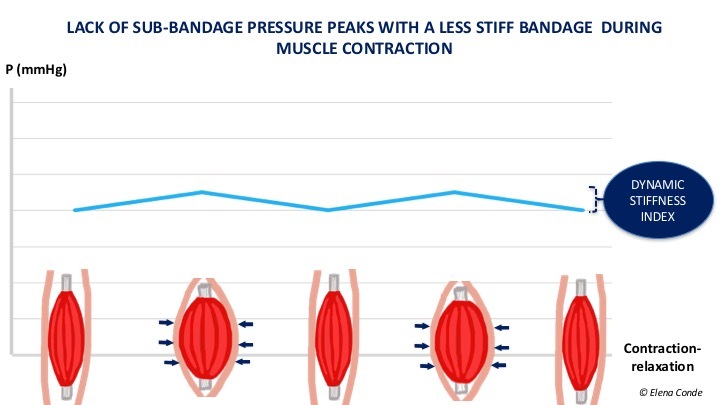 The pressure under the bandage in these cases does not vary much between rest and activity (lower Dynamic Stiffness Index). The concept of “more or less rigid bandage“ should replace the current classifications of “inelastic and elastic bandages”. As we have seen, elasticity is a property of the bandage outside the patient. In single-component bandages the simplification “inelastic bandage = inelastic bandage” and “elastic bandage = inelastic bandage” can be practical in our daily life. However, taking into account that all bandages are multi-layer and many are multi-component, the mechanical characteristics of the bandage vary with respect to those of the bands that compose it. In fact, friction between the layers of a bandage, especially if there is a cohesive component, increases the stiffness of the bandage. Likewise, if we apply an elastic band on a herringbone pattern, we get a more rigid bandage. And what is the cutting point to differentiate the bandages according to their greater or lesser stiffness? 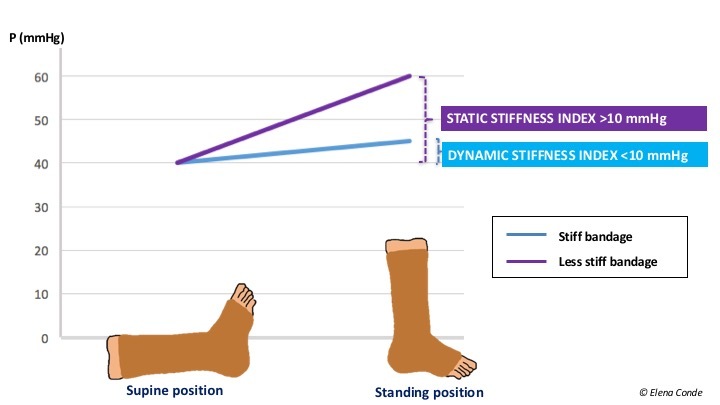 The differentiation between more or less rigid bandages is made using the Static Stiffness Index (SSI). 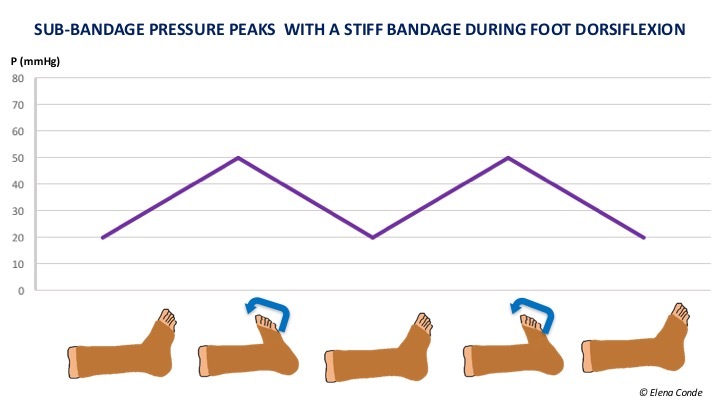 This index is the difference in pressure under the bandage that occurs when the patient moves from lying down to standing. 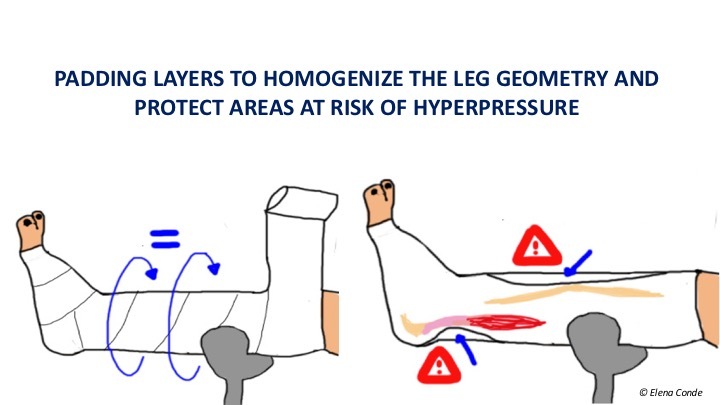 If the pressure difference is greater than 10 mmHg, it is considered a high stiffness bandage and if it is lower, a low stiffness bandage. All this helps us to understand the reason why muscular atrophy or mobility limitation decreases the effectiveness of compressive bandages. But this immobility should not be the reason for not applying compressive therapy, nor should a certain degree of arteriopathy be. In immobile patients with peripheral artery disease with ITB>0.5, bandages with a high stiffness index and pressure below 30 mmHg is a safe and effective option if foot dorsiflexion exercises are performed. This is because muscle contraction during dorsiflexion movements of the foot produces pressure peaks that facilitate venous return, with the consequent decrease in venous hypertension. In addition, we can have a double benefit, since the resulting reduction in oedema can improve arterial flow.